Going for a walk with your pup isn’t just a way to bond; it has several health benefits for both you and your dog. A simple walk can improve both your and your dog’s mental and physical health. And don’t forget that a tired dog is a good dog, which might be the best benefit of a walk around the block. Exercise is important for both you and your pet. Most doctors recommend that you exercise for 30 minutes a day three times a week to improve energy, reduce blood pressure and generally feel better. Of course, you can walk for longer periods and for more days per week but check with your doctor and your dog’s vet before starting. It’s said that taking a walk can help improve your pet’s digestive health. Most dogs will find the need to go while on the walk, so don’t forget the waste bags . If your dog is constipated, a walk might get him going in more ways than one. Pet parents report less destructive behavior when their pets get walked regularly. If your dog is chewing, scratching or digging, try walking him several times a week to see if his behavior improves. Socialization is an important part of your emotional health, and it’s important for your pet to learn how to socialize with other people and animals. 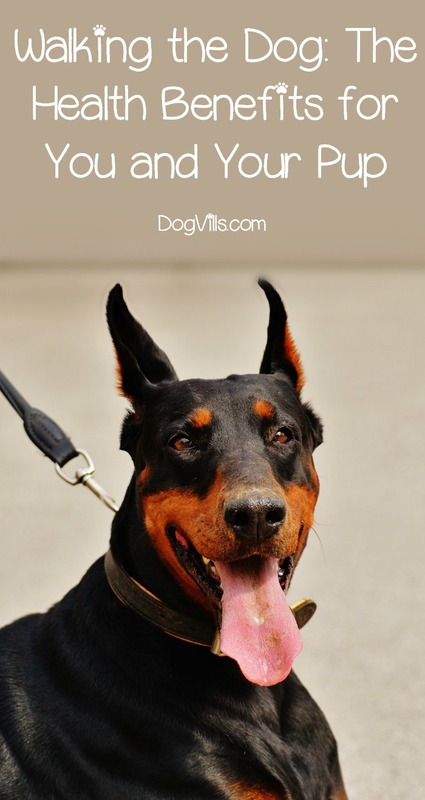 Your dog will be exposed to new and interesting sights and smells in addition to new people. While you have a chance to chat and make small talk with new people, your dog will learn how to behave around new people. Your dog is likely to meet both people and dogs on your walks. This will help your dog learn how to interact with people and animals, which can help him boost his confidence and be well socialized. Exercise can help both you and your dog sleep better. During the walk, you’ll both expend extra energy, making you both calmer and better able to fall asleep and stay asleep. After a walk, you’ll probably both feel more relaxed, which can also help you fall asleep easier. Just like you get bored when you don’t have anything to do, your dog does, too. When your dog gets bored, he’s more likely to be naughty at home. Some dogs sleep when they are board, but others like to chew or cause other mischief. Going for a walk several times a week can help alleviate boredom for a happier pup. If possible, take different routes or walk the same route backwards so you and your dog don’t get bored with the route. Spending most of your time at home without much interaction can get lonely. Going for a walk gives you and your pet a chance to get out and meet new people. This is especially true if you live alone. Going on walks with your dog can strengthen your bond. Creating a strong bond is important to your pooch’s behavioral health and can have lasting effects on your relationship. If your dog is engaging in attention getting behaviors like barking, going for walks may give him the attention that he wants, so he will reduce the behavior. Going for a walk with your dog can be a great time to work on training, especially if your dog is a puppy. First, you’ll have to use a dog harness and leash with your dog, so you can teach him the basic commands of dog walking. It’s a good time to work on learning how to heel, sit and stay. If you and your dog haven’t been walking, it’s important to be safe. You should start with 10 to 15-minute walks and gradually increase the time to 30 to 60 minutes. Don’t walk in extreme heat or cold. Not only will you both be uncomfortable, but you could also risk injury. Your dog’s paws could get burned in the summer or frostbite in the winter, so always be mindful of the temperature of the ground. In the summer, walk in the morning or evening to avoid the heat. In the winter, walk afternoon when the temperature will be the highest for the day. Don’t forget to wear sunscreen when you walk. You can burn your skin or lips if you’re out too long in the sun, even in the winter, so apply some sunscreen before you start walking. It’s important to know the leash laws in your area. Even if your local ordinances permit walking a dog without a leash, use a dog harness and leash to train your dog how to walk on a leash until your pet can safely walk without one. Even though your dog will be on a leash, always have identification with your name and phone number on your dog’s collar or dog harness. If the leash should slip out of your hand or break, someone can call you if your dog runs away. If you plan on walking at a park or other community area, make sure that dogs are permitted before you walk. Some state parks do not allow dogs, and some only allow dogs in certain areas. If there are no signs posted, check the website before you go. Always watch your dog when children approach you or your dog. Children can unpredictable at times, so make sure to read your dog’s body language carefully to prevent any potential problems. Plan on taking waste bags and water with you. There are lightweight collapsible bowls that you can fit in your pocket, so your dog can have a drink on the go. If you’re walking at night, it would be a good idea to get a reflective vest for both you and your dog. With so many health benefits for both you and your dog, it’s hard to say no the next time your pooch wants to go for a walk. Just don’t forget your dog’s harness, leash, water and waste bags to clean up after your dog. About the author: Emily Conklin is the owner of Gladwire.com, a website dedicated to promoting positive messages through trending news, motivational posts, uplifting stories, especially on pets. Did you know about all of these health benefits of walking the dog? Can you think of any other great benefits that we missed? Share below!